We recently met up with the Cadet Club Unchained, what is Unchained? Unchained started in the Spring of 2014 as a cadet club that spreads awareness within the Cadet Wing about the crime of human trafficking and connects cadets to opportunities in Colorado Springs to serve human trafficking victims and support efforts to combat human trafficking. Within the Cadet Wing, Unchained holds monthly meetings where cadets gather to learn about current issues in human trafficking as well as to work on projects or listen to speakers. Unchained has hosted speakers from the Exodus Road, International Justice Mission, and from other small businesses and NGOs that work to fight human trafficking and support victims. 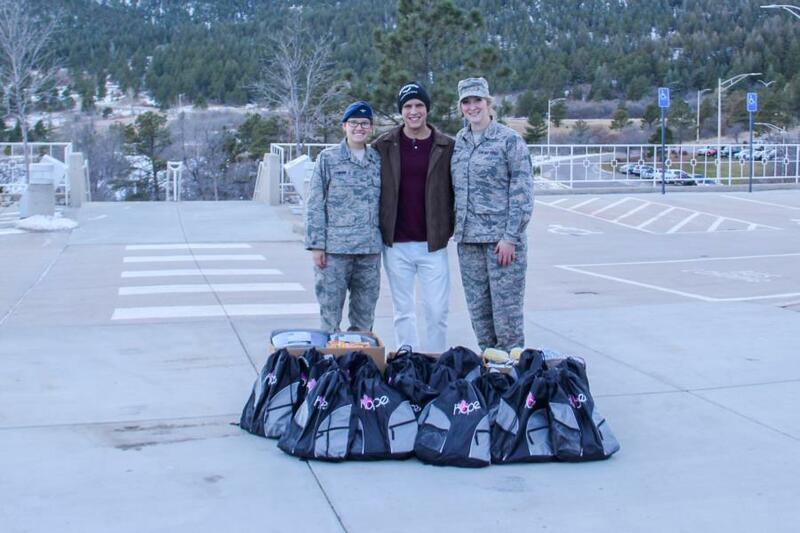 Moreover, Unchained has connected hundreds of cadets to volunteer opportunities that range from Stands for Freedom at USAFA that raises awareness about the issue, to bag drives that collect items for human trafficking victims. Unchained has additionally encouraged cadets to volunteer on their own time with programs such as the Exodus Road TraffickWatch programs, which has given the cadets the opportunity to help local police departments monitor the streets of Colorado Springs to stop and prevent human trafficking. Capt Jessica Schroeder from the Department of Management has served as the OIC since the club’s inception. The Club has recently had a bag drive and collected items for the victims of human trafficking and are going to be donating what they've collected, this month. We were able to get a picture of some of the Cadet Leaders of the Club with the donations they've recieved before they turn them in.